Dry pinned and microscope slide insect specimens are stored in Cornell style insect cabinets and microscope slide cabinets in the climate controlled collection room (room 216) of the Division of Arthropods. Other insects and arthropods that are stored in ethanol are housed separately (room 125). Research voucher and reference collections are maintained for UNM researchers for ongoing systematic and ecological research projects. 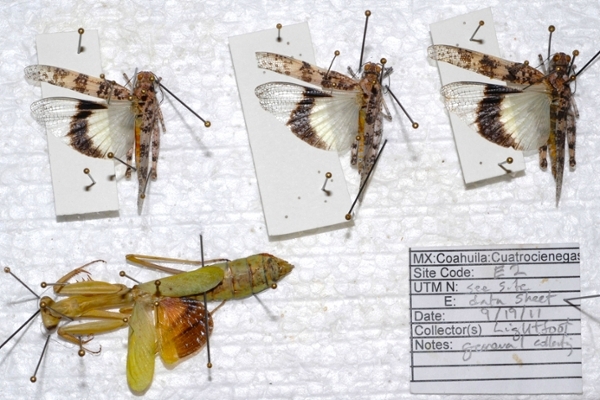 Specimens within those research collections are maintained by both staff and outside researchers. These specimens may eventually be accessioned into our collection, or may be removed and housed in other museums once the particular research project has concluded. Specimens may be borrowed from the MSBA collections. Please see the Policy page for details on the loan policy and process. Information about the Division of Arthropods specimens is available through the Symbiota Collection of Arthropods Network (SCAN) portal, an NSF-sponsored Thematic Collections Network (TCN), Award ER 1207371. The records are in Symbiota, an open-source software designed by Ed Gilbert. The SCAN database contains information based on the locality and determination labels from specimens in the Division of Arthropods collection. That information includes collection event data such as locality, date, collector, habitat, collection method, etc. and varies depending on how much information was placed on the individual specimen labels by the collector. The genus and species name as taken from the specimen determination label along with who provided the identification and the year of the identification (see Specimen Label Instruction Form for examples of such data). 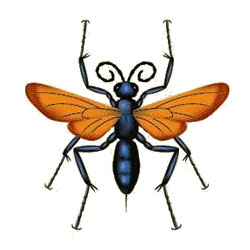 Users may access the SCAN database and Division of Arthropods and other national insect collection’s specimen information. Label information for only a portion of the Division of Arthropods specimens have been entered into the SCAN database. If you are not able to find information on a particular taxon, contact one of the collection managers who can search non-databased specimens for that information. Click on the "Search Collections" tab on the menu bar on the left side of the SCAN Data Portal Home page. The "Collections" page will open. View the list of museum collections available to search, activate the check box for the specific collections that you wish to search, such as "Museum of Southwestern Biology, Division of Arthropods" then click on the "Next" tab on the right side of the page. the "Search Criteria" page will open. Note: you may also click on the "more info" tab following each collection's name to view information about each collection. Enter the criteria that you wish to search, then click on one of the "Search" tabs at the top right or bottom left of the page. The specimen records will then appear. If you wish to conduct other searches, go back to the appropriate previous pages and begin process again. Two working laboratories are available for arthropod research and educational activities. The Collection Work Room (Room 216) is the principal work space for activities involving the Arthropod Collection. The Collection Room is located adjacent to the Collection Work Room. The Collection Work Room provides table space, computers, microscopes, refrigerator and freezer space, and sinks. The Collection Room is considered a clean lab. The Collection Manager's office is also located adjacent to the Collection Work Room. The division’s library is housed in the Collection Manager's office. 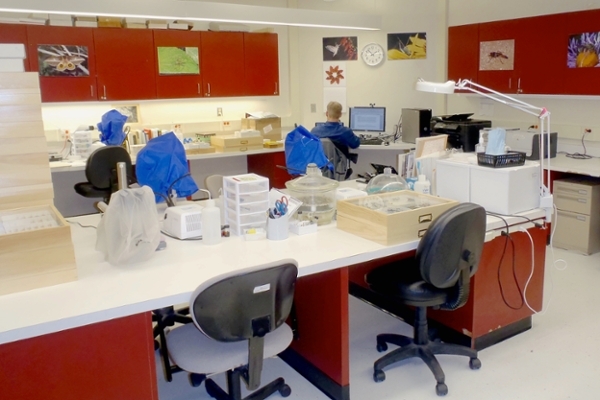 The Arthropod Laboratory (Room 125) provides a working facility for specimens preserved in liquids, use of toxic chemicals, and processing of ecology field samples of arthropods in soil, plant foliage, or other materials. 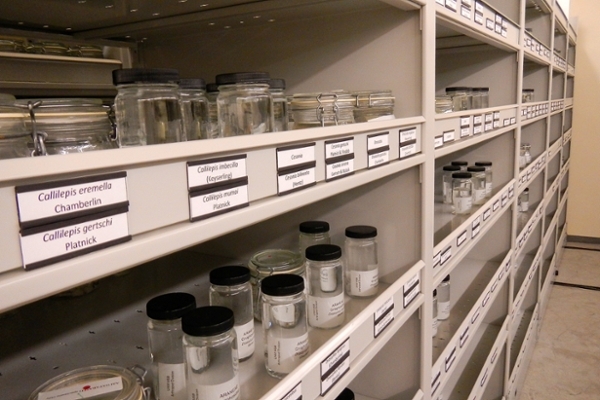 The wet arthropod collection is stored adjacent to the Arthropod Laboratory, and work with those specimens stored in ethanol can be conducted on lab tables. Air hoods are available for work with noxious chemicals and dust. Live arthropods may be kept in a laboratory at the UNM Biology Annex, Room 111A. 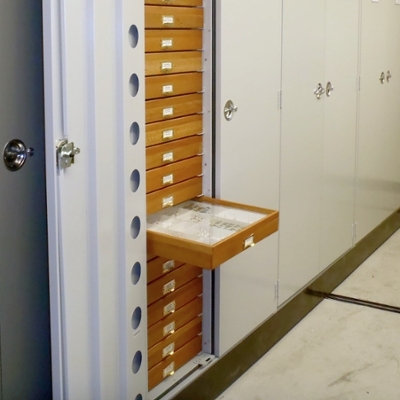 This live arthropod facility may be used to rear immature arthropods so that adults may be obtained for taxonomic studies. The live arthropod lab provides rearing cages, and incubation chambers.